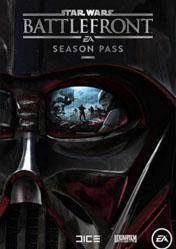 Digital PC version of Star Wars Battlefront Season Pass, on CD key format and activated from the Origin platform. Below is a list of the best prices for Star Wars Battlefront Season Pass cd key at online stores. Once you purchased the digital code, you must have a valid Origin account to activate the game download. Star Wars Battlefront Season Pass will significantly increase the game experience for Star Wars Battlefront offering all the DLC and extra content to be launched for this new shooter set in the Star Wars universe. At first, there is provided 4 packs of expansion or DLC, filled with new content that will take us to new places through a very, very distant galaxy. In addition to the extra content, you can enjoy two weeks before of early access to these new DLC and a unique emote. Galactic scale epic battles, pilot AT-AT on the frozen tundra of Hoth, fighting through the lush forests of Endor in an Imperial speeder bike, engage in combat with X-wing squadrons and TIE fighters, and much more we expect in one of the most ambitious titles this year. Remember that sharing best prices for cd key of Star Wars Battlefront Season Pass via social networks (using the buttons below the images) you can win red tickets to considerably increase your chances of winning the gocdkeys sweepstakes.